That being said, we do offer a few tools that may help you in locating the wine you're after. Search for the wine using the search box at the top of the page (make sure the scope is set to Wines). Locate the wine in the search results, and select it. Then, click the red Where to Buy link in the right panel to be taken to wine-searcher.com, our partner who aggregates retail availability. They'll show you a list of which retailers may have that bottle available. 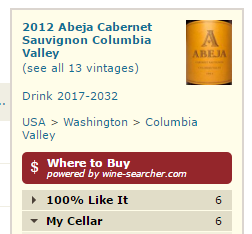 If wine-searcher.com doesn't return any helpful results, the wine may no longer be widely available at retail, or it may indicate it's only available through exclusive channels. You can see the top stores where other CellarTracker members have purchased the wine by clicking on the Top Stores link under the Community Holdings section of the right panel. Using that, you can look up the stores and reach out to them directly to see if the wine may still be available.